Don’t open PowerPoint, Keynote or Prezi just yet. If you really want to make an impact with this presentation, you need to think about why you want to present. 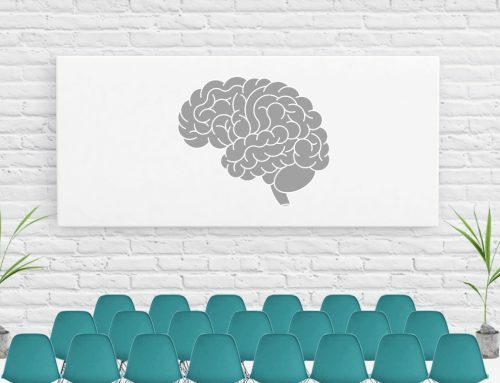 Get your goal clear first, because when nobody understands why you’re giving a presentation, none of the tips we’ll share here will save you. This blog will help you go through the storytelling process and get to the point where you can actually start building it (and where this blog about improving your slide design will help you further). 1 Define your goal: what do you want to achieve with this talk? More often than not, you will be asked to give a presentation without being provided with a goal for that presentation by the people who invite you. So you are free to pick your own! And unless you’re merely entertaining (and aren’t you better than that?) you will need to think about your goals and what you want to achieve with your talk. Even when your only goal is to entertain, that is your goal. These are good goals in themselves, but you should adapt them to the circumstances of your talk. For example, you will have to keep into account what the amount of time is that you have for your story, what the expectations of the audience may be, why you’ve been asked and what the overall theme of the symposium or conference is – if there is any. 2 Define your message: what do you want people to remember? When thinking about your message, don’t overdo it. Try to stick to one message, since people have a hard time remembering more than one. Of course, the longer you have, to more elaborate or well-supported your message can become, but its core should still fit in one sentence. That one sentence will be the basis for your presentation; start and end with it! On the first slide, it will give your audience a feeling of context and direction, on the last it will serve as a reminder and summary. When you have your message clear, you can build the story. 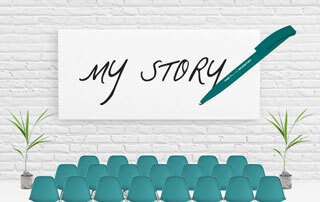 What does your audience – this specific audience – need to know or understand before you deliver (parts of) your story? What facts do you have to support your message? This story will guide them through your main message. You probably needed some time to arrive at your conclusion, so allow your audience some time as well. Why is your main message so important? What is the evidence to support your message (why is it true)? Think about what do you want to explain, and what evidence you have for this narrative? Do you need to make side steps? Write all of this down, then rewrite it and rewrite it again. This is not a waste of time, since you can use the result to fill the notes section in your presentation – this is basically the story you will tell on stage. Your slides will become the illustrated background to that story, where you showcase the evidence, anecdotes and examples. At the end of your presentation you will have reached your goal by means of your message: an effective presentation. Not every audience member is the same. Some people are very emotionally engaged, while others respond more to facts and ratio. This is exemplified by the classic Greek terms of logos, ethos, logos and pathos –logic, ethics and emotion. A good story balances the three, so as to serve all three kinds of audiences. In other words: your entire audience. To do this successfully, you need to get to know your audience. As a scientist talking to her peers, you may be right to assume that most of your audience will be at the logic side of the triangle, but that is no excuse to neglect the other two. There will always be a few of the other kind (think policy makers), and any story becomes more compelling if you mix them up. This is logos or reason speaking, and a rational person would say this is all you need to act. This is ethos; a plea for a moral solution and an ethical approach. The main arguments are believed because of the credibility of the author. This is pathos. You evoke emotions by giving the data a face: this is what living with diabetes looks like, and more and more people experience it. Of course these three are intertwined, because with the proposed policy to increase quality of life and reduce loneliness comes the very rational question of what that will cost, for example. But you need to use these three channels the same way as an old television uses red, green and blue to create a multicolored image. This also means your story will need more space (time and slides) than a presentation that just addresses the ‘logos’ side of things. Of course, this seems gratuitous. And if you have followed step 1 to 4 securely, it’s redundant. But our experience is that more often than not, it’s good to go over your presentation one more time (or twice, no pressure) and ask at every slide: ‘is this adding value? Does this help me tell my story? Reach my goal?’ If it doesn’t, try tweaking the contents. If that doesn’t help, delete it. And remember, because your slides are a means to an end, it’s not bad to tell part of your story without slides if they don’t help you reach that end. 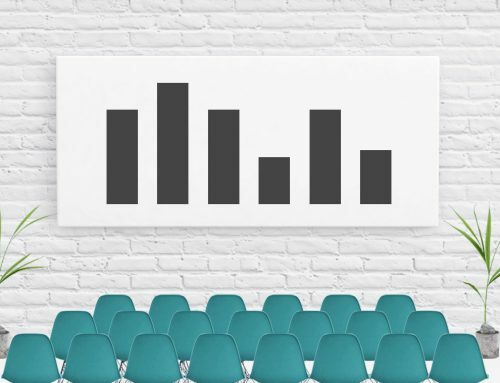 If you feel a slide does not convey the idea very well, or if you want the audience to focus entirely on what you’re saying, use a black slide and just talk. It’s better to leave out something than to force a slide in there. You can use these five steps right away on your next presentation. It seems like a lot of work, but it is! Giving presentations may be common, but let’s not forget that it’s more than a filler in between the coffee breaks. With every talk, you have the opportunity to change your audience. It’s valuable to at least think about and realize that potential. Don’t hesitate to contact us when you struggle or if you want more extensive advice, We’re here for you! Stephan enjoys the process of understanding complex matters and being able to present them in a comprehensible way. His vision is that science and society can benefit from clear science communication, and that technology can aid this development in various ways, from science websites for the public to academic e-learning for students. 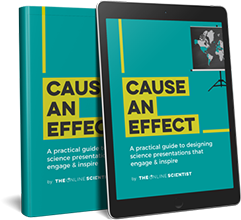 Check out our brand new ebook to help you design science presentations that engage and inspire. This practical book – by scientists, for scientists – helps you get rid of slides full of data and present with clarity instead. At The Online Scientist we have a scientific education, but found our calling in helping other scientists communicate about their research or the results coming out of it. When we do this we aim to create the perfect marriage between nuance and clarity, while tailoring it to the targeted audience. Contact us to discuss your research or project. We will give you advice on how to approach it and/or make a quote for what you need – no strings attached.